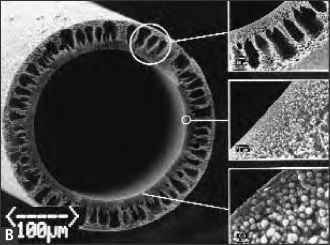 Scanning electron microscopy of a conventional low-flux-membrane hollow fiber (panel A) and a synthetic high-flux-membrane hollow fiber (panel B). The low-flux membrane consists of a single layer of relatively homogenous material. The high-flux membrane has a three-layer structure, ie, finger, sponge, and skin. The skin is a thin semipermeable layer that functions as the selective barrier; it is mechanically supported by the sponge and finger layers. (Magnification: finger, X 14,000; sponge X 17,000; skin X 85,000.) (Courtesy of Goehl H, Gambrogroup).